One of the great things about living in central London is being able to pop out on any day of the week to an interesting event. This week I went to a London Quantum Computing meetup (no jokes about trying to find it please) where Dr Ashley Montanaro from Bristol University gave a talk on Quantum Algorithms to a fairly knowledgeable but not specialised audience. There were four important elements of quantum mechanics that he talked about: superposition; collapse; entanglement; and uncertainty. Alongside these he showed us photos of the different experimental computers based on: photons; super-conductors; and trapped ions. Surprisingly, to me anyway, there’s no agreement yet on the best way to build them. Square root cropped up a lot as the typical efficiency saving over traditional computers; apparently the trick is to use very clever algorithms to exploit this incredible efficiency to perform calculations in a couple of weeks that might otherwise take thousands of years. It was fascinating to hear what quantum algorithms can do that traditional algorithms can’t. For example, they can simulate physical quantum systems so we might understand photosynthesis, create incredibly efficient solar panels and model the effects of quantum drugs on the human body. Another possibility is breaking cryptosystems and internet security. 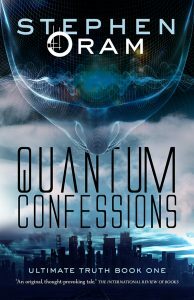 A revelation that led to audience speculation about how far the world’s security services have got in developing quantum code breakers. It’s not until we start to use these algorithms that we’ll really know the possibilities they’ve opened up. 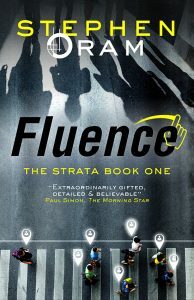 After Paul Simon reviewed Fluence in the Morning Star we talked about how reviews could be more collaborative. 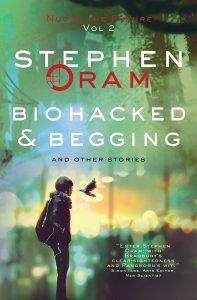 In some ways I think Eating Robots and Other Stories lends itself to discussion more than a novel because the stories are short and in most cases deliberately written to provoke debate. 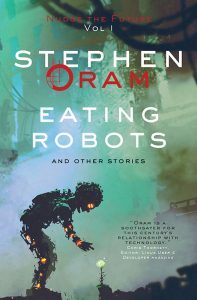 This post is dedicated to discussions about stories in Eating Robots; to start a new discussion post a comment and to join in a discussion already underway post a reply. If you want some prompts, some provocations, to get started there’s some here.